1. Is the file name descriptive, and is the file in .pptx format? Instruction: Look at the filename in Windows Explorer or the title bar in MS PowerPoint. An example of a descriptive filename is "AccessibleElectronicDocuments.pptx." The file must be in the "*.pptx" format for accessibility testing to be possible. NOTE: If the document extension is not displayed, open your documents folder in Windows Explorer, select "View">check "File name extensions". Test A: Is the file name descriptive and does it identify the document or its purpose? If not, the document fails this test. Test B: Is the file in "PowerPoint (.pptx)" format? If not, the document fails this test. A descriptive file name identifying the document or its purpose helps everyone (including people with disabilities) locate, open, and switch between documents. In addition, the document must be in a ".pptx" format because these authoring and testing instructions will only work if the file is in the ".pptx" file format. Save as type: "PowerPoint Presentation(*.pptx)"
Save the document with a descriptive file name. 2. Does the reading order match the visual layout? Instruction: Open the Selection pane ("Home tab > Drawing group > Arrange>Selection Pane"). The first object on the slide will display at the bottom of the Selection Pane. Starting from the bottom and moving to the top, select each object to view the reading order on the slide. Test: Does the selection of each object match the visual reading order of the slide? If not, the document fails this test. 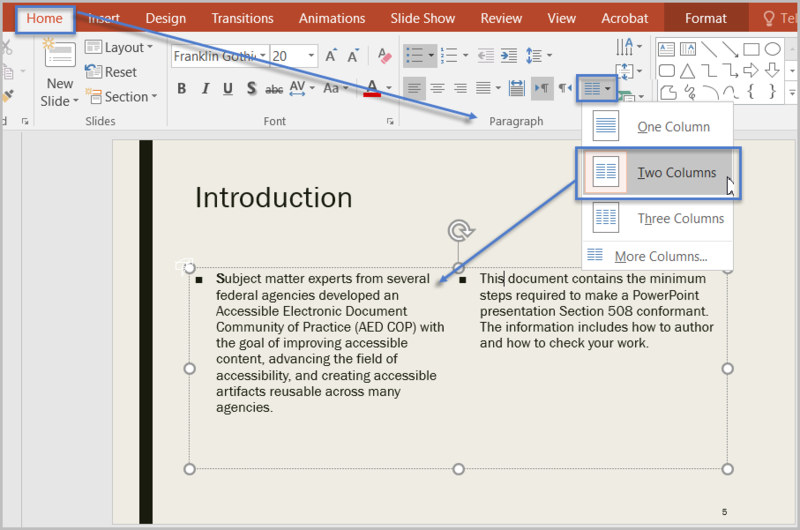 Objects (such as text, pictures, and tables) in PowerPoint slides must be placed corresponding to the visual reading order to ensure assistive technology reads the slide content in a logical manner. When adding objects to a slide, use the Selection Pane to arrange the visual layout to follow the intended reading order. Manually move objects listed in the Selection Pane (by using drag or cut-and-paste) to match the visual reading order. 3. Are lists formatted correctly? Instruction: Place your cursor on a list item. Determine if one of the list formatting indicators ("Home tab>Paragraph group") is selected. Test: Is the list formatting in the Paragraph group highlighted? If not, the document fails this test. Lists organize and structure content. Assistive technology users cannot infer meaning if you just format with tabs, a dash, or a number. Using built-in list features applies the formatting that assistive technology needs to both identify and present lists to users with disabilities. 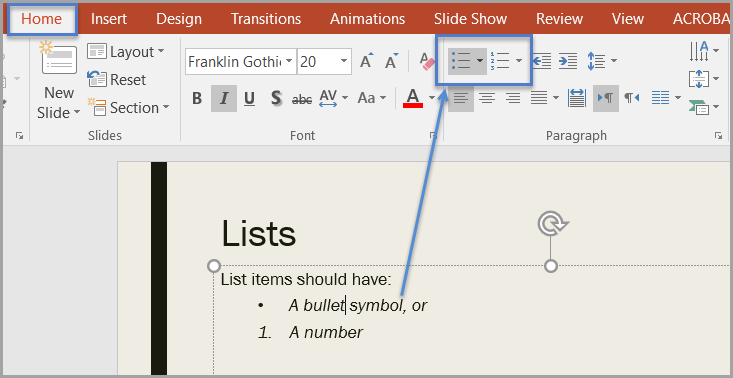 Select "Home tab>Paragraph group" and select the "Bullets" or "Numbering" option when using lists in your presentation. Type your list item and then select the list feature you want to use. 4. Are columns formatted correctly? NOTE: If content does not appear in columns, you do not need to perform this test. Instruction: Place the cursor on columnar text. Select "Home tab>Paragraph group >Add or Remove Columns" option and determine if columnar formatting is enabled. Test: Are the correct number of columns highlighted? If not, the document fails this test. Screen readers and assistive technology cannot read information in the correct reading order when using tabs or spaces to separate content into columns. Select "Home tab>Paragraph group >Add or Remove Columns" option and choose the number of columns desired when creating columnar text. 5. Is text formatted for the intended language? NOTE: If the document only uses one language, you do not have to perform this test. Instruction: If the presentation contains words or phrases in a language other than the predominant language, place your cursor on that text. Select "Review tab>Language group>Language>Set Proofing Language." Test: Is the text formatted in the correct language? If not, the document fails this test. A presentation can contain sections written in different languages. Assistive technology cannot infer the correct pronunciation from just text, so text must be formatted in the correct language. 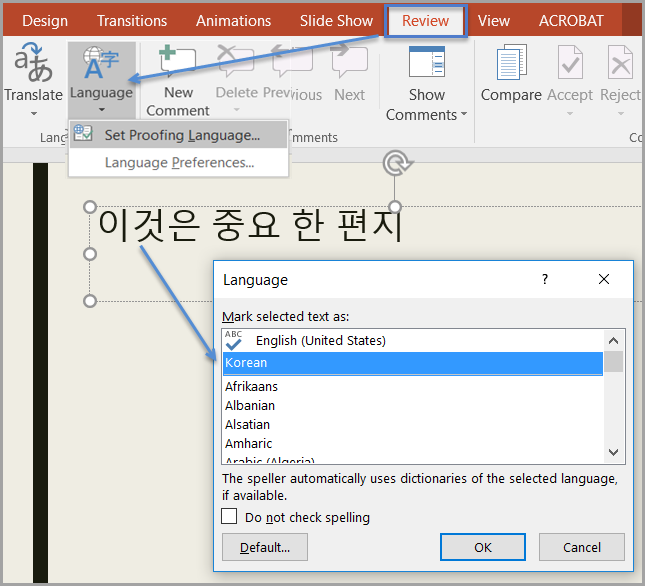 Select text written in a different language. Select "Review tab>Language group>Language button>Set Proofing Language." Select the appropriate language from the list. 6. Are link names descriptive? Test: Do links have meaningful names that describe their destination, function, and/or purpose OR are these determinable within context? If not, the document fails this test. Assistive technology users rely on meaningful names to determine the destination, function, or purpose of links. For example, multiple "click here" links confuse assistive technology users because the name for each link is the same, while the destinations may be different. To edit the name of a link, place your cursor on the link and edit the text. NOTE: deleting the last character in the link name will remove the link. To create a hyperlink, select or type the hyperlink text and either right click and select "Hyperlink" or use "Ctrl+K" to open the "Insert Hyperlink" configuration window. Specify/verify the "Text to display" and the "Address" for the link and its destination, and select "OK."
7. Is vital information in the background (i.e. Slide Master) included in the presentation? Instruction: Look for vital information in headers, footers, and watermarks (e.g. Respond by X date, CONFIDENTIAL, or Do Not Distribute). Select "Home tab>Drawing group>Arrange>Selection Pane." 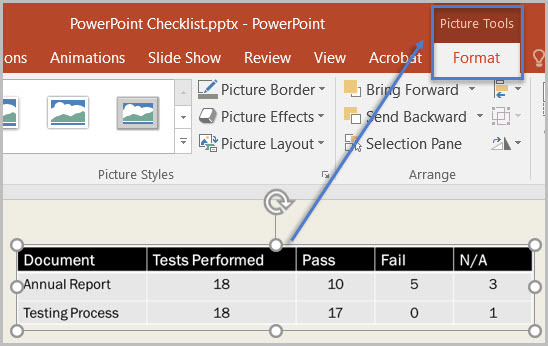 Test: Can the vital information be selected within the Selection Pane? If not, the document fails this test. Vital information can be included in a separate text box on the Slide Master (background), or in the Header/Footer of the slide. Headers and Footers have to be enabled. 8. Did you use built-in features to create data tables? Instruction 1: Select a table. If the "Picture Tools" tab shows up in the Ribbon, instead of the "Table Tools" tab, then the table is a picture. Test A: Is the document free of pictures of tables? If not, the document fails this test. 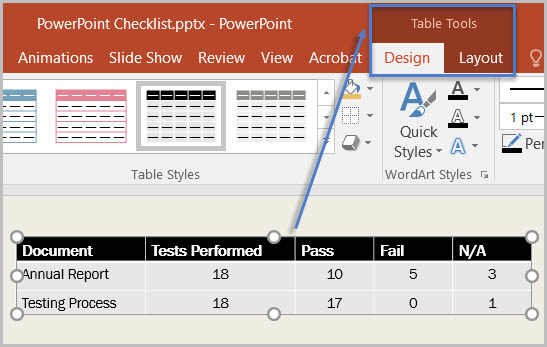 Instruction 2: Place your cursor on a table, and use the "Tab" key to move between table cells. Make sure cells don't span more than one column or row, which would indicate merged or split cells. Test B: Are tables free of merged or split cells? If not, the document fails this test. Select the number of columns and rows you desire. Do not merge or split cells. NOTE: If you need to create data tables with more than one header row, one or more header column, and/or merged or split cells (complex data tables), then you must convert the presentation to an accessible format (i.e. a PDF document remediated for accessibility). 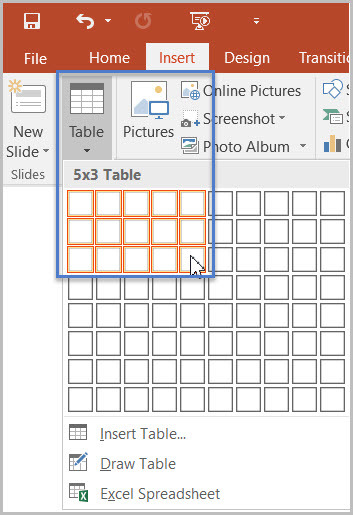 Complex data tables cannot be made accessible in MS PowerPoint. 9. Do images and other objects have alternative text? Instruction 1: Select an image or object "right click (or Shift+F10)>Format Picture (Note: could say Format Object, Format Shape, etc. )>Layout & Properties icon>Alt Text," and read the "Description" field. Also, look for a caption or a description of the image or object in nearby text. Test A: Does the image/object/shape have descriptive text as alt text, a caption, or is it described in the surrounding text? If not, the document fails this test. Instruction 2: Select an image or object that is just for decoration, right-click (or Shift+F10)>Format Picture (Note: could say Format Object, Format Shape, etc. )>Size & Properties icon>Alt Text, and read the Description field. Test B: Does the "Description" field of decorative images or objects contain two blank spaces between quotes? If not, the document fails this test. Assistive technology cannot infer meaning from images and other objects. Images and other objects include pictures, images of text, images of tables, shapes, icons with hyperlinks, etc. To enter "Alt Text," select the image, object, or shape. "Right click" or "Shift+F10" and select "Format Picture (Note: could say Format Object, Format Shape, etc. )>Alt Text." In the "Description" field, enter information that states the purpose (in as few words as possible while remaining clear) for a meaningful image or object or enter a space or two spaces between quotes for decorative objects. Then select "close." 10. Are colors and other visual characteristics that convey information also described in text? Note: Using only color or other visual characteristics, such as size, shape, and location, to convey meaning will not provide comparable access to people who are blind, have low vision, or are colorblind. Instruction: Find where you have used color and/or other visual characteristics to convey meaning such as green, yellow, red, etc. Test Is there text that conveys the meaning of the color or other visual characteristics. If not, the document fails this test. 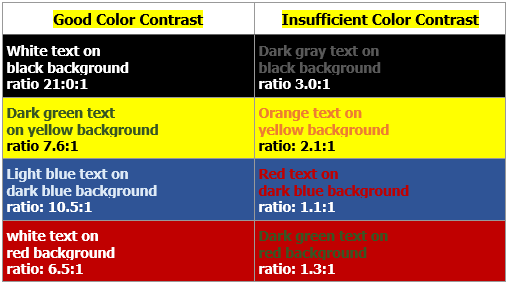 The following layout tables describe the progress for three projects using colors to symbolize the current project status. Adding text in addition to the color provides comparable information to users of assistive technology and people who are colorblind. Use text to duplicate the meaning of the color or visual characteristics (such as size, shape, and location). 11. Is the contrast ratio between text and background sufficient? NOTE: If the document text is black on white background (or close to it), you do not need to perform this test. 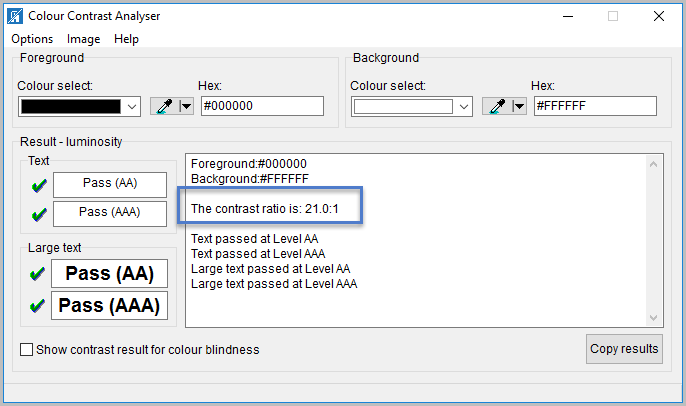 This test requires the Colour Contrast Analyser. Instruction: Execute the Colour Contrast Analyser. Select "Download" (the application can be executed without downloading it onto your computer). Open the Colour Contrast Analyser. 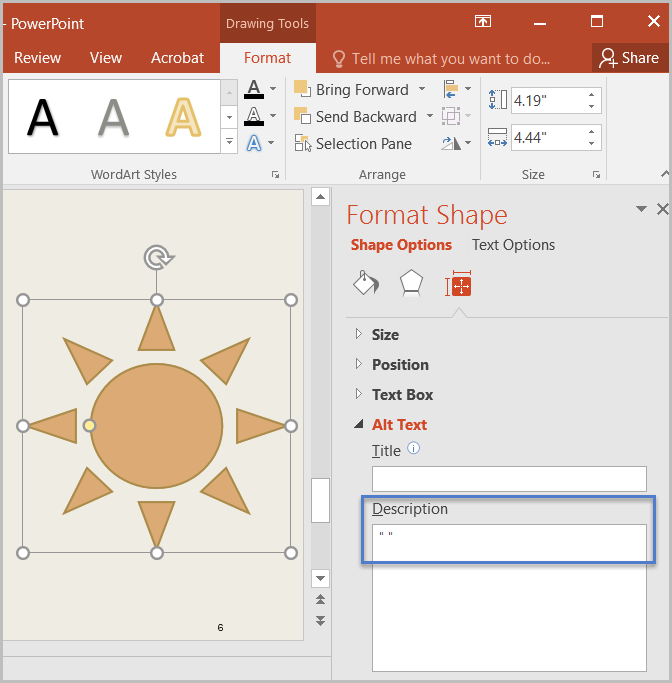 Drag the "Foreground eyedropper" icon over a sample of your text or image of text. Drag the "Background eyedropper" icon over a sample of your background color. 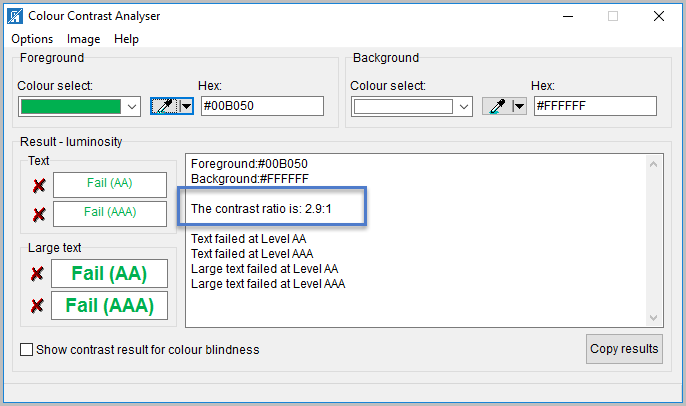 Test: Have you formatted with the correct color contrast ratio? If not, the document fails this test. Create content with text or images of text that use color or shading with sufficient color contrast. If the contrast ratio does not pass, then adjust your foreground or background until it does pass. 12. Are descriptions of embedded audio, video and multimedia files accurate? NOTE: If the document does not contain audio, video, or multimedia files, you do not need to perform this test. Instruction: Activate the audio-only, video-only, or multimedia file. Test: Is there an accurate and complete text transcript for multimedia files, text description for audio files, and synchronized caption and/or audio description for video files? If not, the document fails this test. 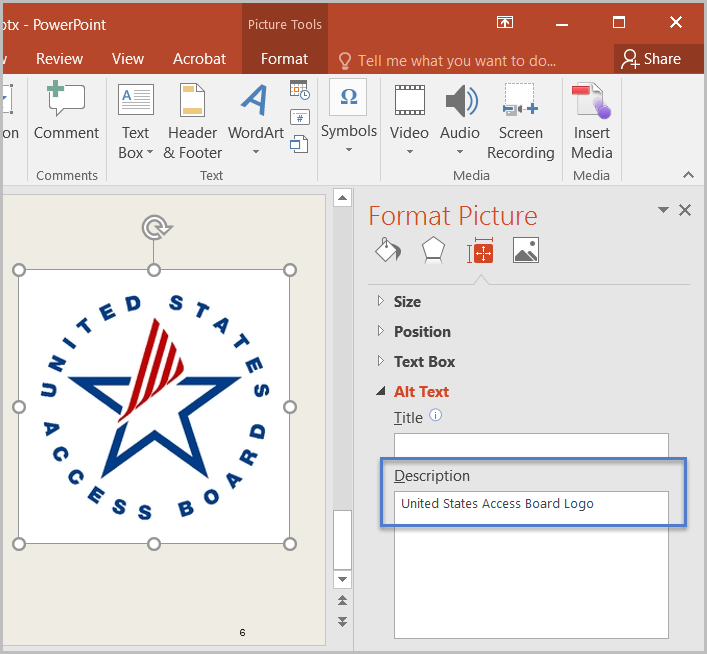 If you embed an audio-only, video-only, or multimedia file that contains meaningful information into your MS PowerPoint document, you must also provide additional information so that individuals with disabilities have comparable access to the information. 13. Did you exclude flashing objects? Test: Is the document free of all flashing objects? If not, the document fails this test. Create your content without using flashing objects. Flashing objects can cause seizures and should never be used.